This ceremony at the Wagha Border near Attari village in Amritsar is worth a witness. This is the only border which is connected by road to Pakistan. Every evening, both the countries lower down their flags and close the gates with a special ceremony called beating retreat. ‘Live life king size’ is the motto of life in Punjab. Men with turbans in vibrant hues walk tall and proud and women clad in salwar-kameez and fulkari (hand-woven scarf) walk around wearing Punjabi jutti(footwear). They greet you with a ‘sat shri akal’ and a smile. Their hearts and smiles are the biggest in the world. From harey bharey khet (green fields) to bhangra (dance form) and from butter chicken to lassi (butter milk), Punjab makes it to the bucket list of travellers. 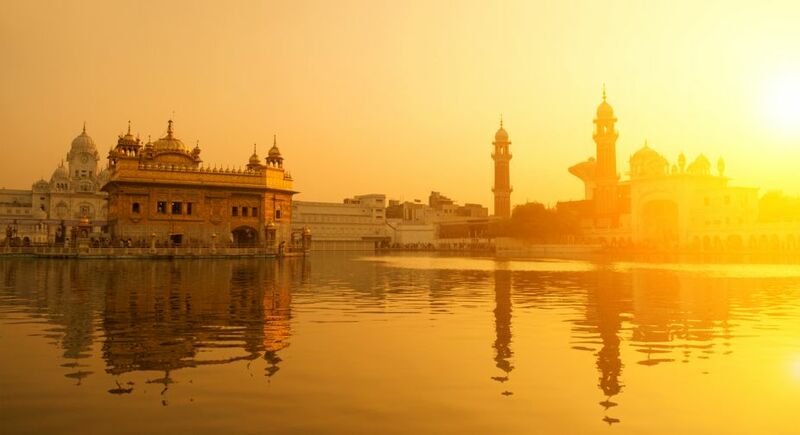 Amritsar, where the Golden Temple is situated, reflects vibrancy of Punjab, patriotism, rich heritage and culture. The 500 feet broad heritage street is a new element added to the beauty of this place. The whole street has a uniform architecture and is full of food stalls. From Lassi and jalebi (a sweet) to amritsari naan ( a kind of bread) and all kinds of chicken, it is a paradise for foodies. Apart from the various festivals that are celebrated in Punjab such as Gurpurab, Diwali, Baisakhi, one can witness a special kind of martial arts called Gatka when visiting the city. Full of energy and enthusiasm, this martial art is performed by a set of skilled people of all age groups. To watch this power packed performance is a must if you are in Punjab. When you reach the city by road you will witness a 100 meters high gateway and if you reach there by train, then you will notice that the entrance of station has an ancient architecture which gives the essence of pre-independence era and in the main hall there is a miniature of Golden Temple showcased. This city has a deep connection with Hindu mythology and goes back to the time of Lord Rama. Durgiana temple is believed to be the place where Sita gave birth to Luv and Kush and Saint Valmiki wrote Ramayana. After Ayodhya, Amritsar is known to be the favourite place of Lord Hanuman. It is said that the drops of Amrit (holy water) fell here and since then it is called Amritsar. The name is also associated with the sarovar of holy water at Golden Temple. Another beautiful historical place not to be missed is the magnificent building of Khalsa College that you see as you pass by the road in the main city. Fort like structure, made with Mughal and Sikh architectural style, in the year 1892, is worth visiting. Amritsar is the heart of Punjab where the past meets the present. From pre-independence era to modernity, you can witness the beauty with which they effortlessly fuse together. Spend a day in the city and night in the premises of Golden Temple and add this trip to the list of most memorable ones.